Martial arts cover a broad range of activities that involve fighting techniques, physical exercises, and methods of mental discipline, among other skills. 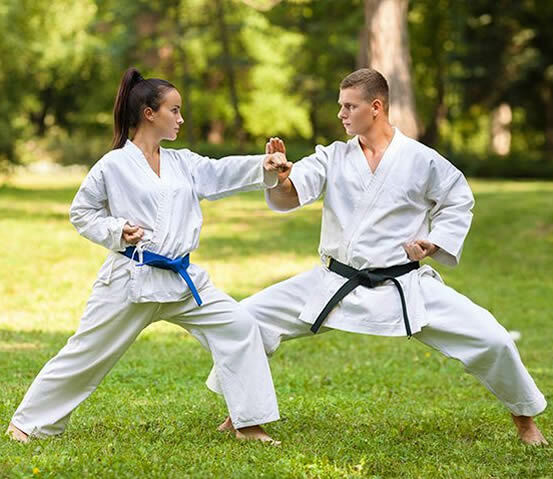 Martial arts originated in the ancient cultures of Asia, and are used today around the world for self-defense, exercise, health, spiritual growth, law enforcement, and athletic competition. Very few activities have as many legends and myths surrounding them as do martial arts. Hundreds of practices are included under the title of martial arts, and some of these were passed down in secrecy for many generations. Furthermore, martial arts developed in countries that have been historically isolated from the Western world. Thus, there are many conflicting theories and opinions concerning the origins of martial arts. What is known is that martial arts began in the ancient cultures of Asia, including China, India, and Japan. In both China and India, artifacts from 2,000 to 4,000 years old have been found with paintings of people striking possible martial arts poses. Qigong, one of the oldest systems that may be considered a martial art, is believed by some historians to be 5,000 years old or older, originating in ancient China. Some scholars trace the development of martial arts much later to the sixth century A.D. According to legend, that is when a Buddhist monk from India named Bodhidharma brought Buddhism, yoga exercises, and meditation techniques to the Shaolin Monastery in China. Martial arts involve intellectual concepts as well as physical techniques, and have been influenced by many of the religious and philosophical systems of the East. The Taoist philosophy holds that the universe operates within laws of balance and harmony, and that people must live within the rhythms of nature. Martial arts cultivate these concepts of balance and adaptation to the natural flow of events. Buddhism is believed to have introduced breathing methods, meditation, and techniques of mental and spiritual awareness to the early founders of martial arts. Chinese Confucianism was concerned with ethical behavior in daily life, and martial arts often address these concerns. Some martial arts, such as t’ai chi and various kung fu methods, developed from qigong. Qigong, which means “energy cultivation,” is a system designed to increase the flow of the body’s qi, the universal life energy responsible for health and strength according to Chinese philosophy. Traditional Chinese medicine also incorporates concepts derived from martial arts to better the understanding of the body and health. Because therapeutic exercise is one of the major modalities of treatment in traditional Chinese medicine, some martial arts masters are also expert healers. There is, in fact, a subtype of qigong known as medical qigong in China, used to treat a wide range of diseases and disorders. Although most of the research in medical qigong has been conducted in China, some of this work has been translated into English. A video is now available that presents the basic concepts of medical qigong. From China, martial arts spread to other Asian countries, and eventually arrived in Japan, where many new variations developed. Karate is the generic term for Japanese martial arts. Martial arts in Japan have been influenced by Zen Buddhism and by the samurai warrior tradition, which refined many weapons as well as methods of fighting. Some Japanese schools of instruction adopted the values of bushido, Japanese for “way of the warrior.” This system insists on extreme physical and mental discipline, using martial arts as a means to spiritual enlightenment. Martial arts also flourished in Korea, Vietnam, and Thailand. Martial arts were largely unknown to the Western world until after 1945, when a few American and British veterans of World War II brought back Japanese martial arts from occupied Japan. During the 1970s, there was a surge of interest in martial arts in America, due to several popular television shows and the charismatic actor Bruce Lee. With better communication and less secrecy among teachers, Chinese martial arts, including t’ai chi and qigong, have made their way to America. Today, there are martial arts schools all across America, and martial arts are a multi-billion dollar industry. Martial arts are a popular activity for self-defense, sport, exercise, spirituality, and health around the world. Present-day forms of martial arts include kalarippayattu in southern India, escrima in the Philippines, pentjak silat in Indonesia, karate in Okinawa, aikido in Japan, and capoeira in Brazil. Martial arts teach self-defense, and can improve confidence and self-esteem. When used as exercise, martial arts can improve balance, strength, stamina, flexibility, and posture. They also enhance weight loss and improve muscle tone. On the mental level, martial arts can teach stress management, improve concentration, and increase willpower. Some martial arts, such as qigong and t’ai chi, are used for longevity, disease prevention, and healing purposes, making them effective exercises for those with health conditions and for the elderly. Some teachers claim that martial arts can be used as spiritual practices, bringing balance, peace, and wisdom to dedicated practitioners. Many martial arts utilize basic concepts of traditional Chinese philosophy. Qi is the fundamental life energy of the universe. In the body, qi is the invisible vital force that sustains life. Qi is present in food, air, water, and sunlight. The breath is believed to account for the largest quantity of human qi, because the body uses air more than any other substance. All martial arts emphasize breathing techniques. Many movements and mental exercises are designed to improve the flow of qi in the body, which improves overall strength. There are many legends concerning martial arts masters who had such control of their qi that they could throw opponents across rooms merely by looking at them. Martial arts that focus on the development and use of qi are termed internal martial arts. In contrast, external martial arts focus on physical exercises, fighting methods, and the use of weapons. Many martial arts combine internal and external methods. Qi travels through the body along channels of energy called meridians. On the meridians there are certain points (acupoints) where qi accumulates. Some martial arts teach defensive techniques that utilize the knowledge of these points on the body, which, if pressed in the correct manner, can be used to immobilize attackers. Martial arts also teach massage and exercise techniques that are designed to stimulate the energy flow along the meridians to improve health. The concepts of yin and yang are also central to the martial arts. Yin and yang are the two separate but complimentary principles of the universe, which are always interacting, opposing, and influencing each other. Yin is associated with such qualities as cold, passivity, darkness, yielding, and inward movement. Yang is associated with heat, activity, light, assertiveness, outward movement, and so on. In martial arts, yin and yang movements are used to balance each other. For instance, a strong (yang) attack is taught to be met by a yin, or yielding, response. Martial arts cultivate an awareness and use of yin or passive qualities, which are ignored by many sports and fighting techniques. Another major yin/yang concept used in martial arts is that the more one becomes familiar with violence, the more one learns to avoid and resist it. Some martial arts, such as aikido, teach peace as their ultimate lesson. Although there are hundreds of different martial arts, many of them have more similarities than differences. Within the major categories, there are often many sub-schools and systems developed by different teachers. Martial arts are generally classified as soft or hard, internal or external, yin or yang, but they all need to embrace these complementary aspects. Internal arts such as qigong focus on yielding and inner strength. Hard arts such as karate focus on developing muscular power and speed, and the mastery of breaking and throwing techniques delivered with devastating impact. Karate means “empty handed.” This form of fighting originated on the Japanese island of Okinawa. Karate is now the general term for an entire group of Japanese martial arts. Karate emphasizes offensive and defensive moves, and avoids grappling and wrestling. 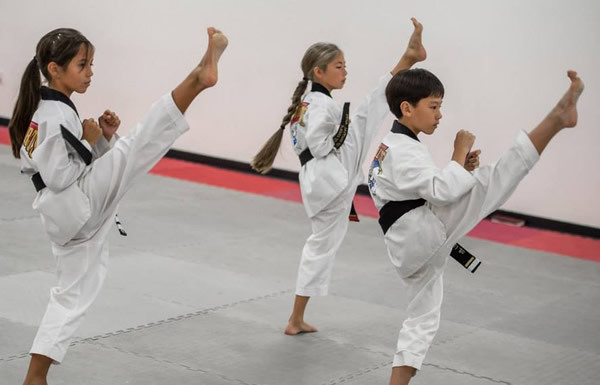 Students are taught how to deliver quick, powerful blows with nearly every part of the body, including dangerous kicks with the legs. Karate also consists of hard styles and soft styles. Some schools teach “full contact” karate, for which students wear protective equipment to absorb the blows of actual fighting. Kung fu means “skill” in Chinese, and is the generic term for a whole spectrum of martial arts methods that developed in China. In China, kung fu is called wushu. Kung fu consists of thousands of hard and soft techniques, taught for both offensive and defensive positions. Kung fu uses punching, kicking, grappling, and blocking moves in addition to the use of certain weapons. Kung fu may also emphasize internal methods to increase and improve qi energy. Aikido teaches students a variety of techniques to disarm an attacker, including such defense moves as blocks, escapes, grabs, and falling safely to the ground. Aikido also teaches internal methods of cultivating qi energy. Aikido has been called the “way of peace,” because it teaches the philosophical ideals of love and harmony as ways of reducing conflict. Judo means “gentle way” in Japanese and was developed as an educational tool by a teacher named Jigoro Kano in the 1800s. 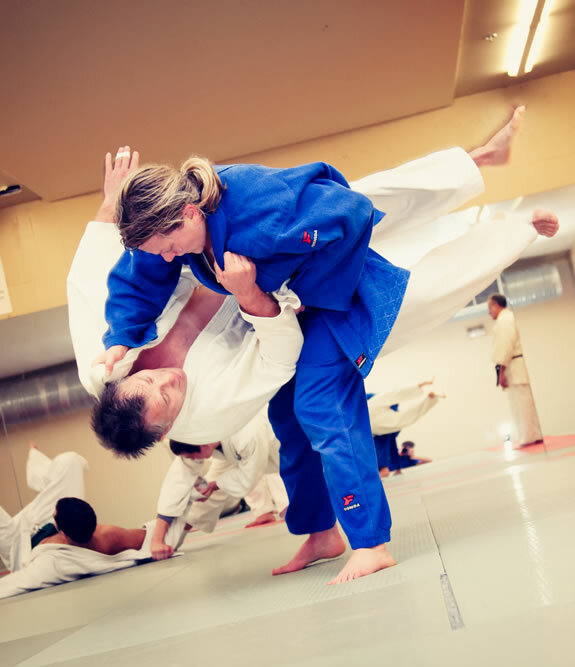 Judo emphasizes such defensive moves as holds and grappling, and teaches students how to disarm attackers by applying pressure to specific sensitive points on the body. Judo is performed competitively in matches. T’ai chi chuan, also called t’ai chi, consists of a sequence of flowing movements performed very slowly. These movements emphasize posture and the flow of the body’s energy (qi). Although considered a martial art and consisting of fighting postures, tai chi is used more as a meditation and health technique. In China, millions of people, particularly the elderly, use tai chi daily to improve their health and flexibility. T’ai chi developed from qigong and shares many of the same concepts of energy cultivation, making it effective for healing and prevention of illness. Tae kwon do consists of a variety of powerful kicking and punching techniques. Kendo is traditional Japanese sword fighting, teaching students how to use various weapons with agility, speed, and effectiveness. Kendo also emphasizes discipline and ethics. Most martial arts classes, held in schools called dojos, have similarities. Sessions begin with warm-up exercises and stretches. Then, depending on the school, certain exercises will be performed to improve strength, speed, and stamina. Sparring is often used, with students competing head to head. Some schools require students to stop short of striking one another, while other schools require students to wear equipment to protect them from authentic blows. Exercises for cooling down and for flexibility are performed at the end of class. Martial arts classes take between one to two hours. Some schools allow students to attend as many classes per week as they wish, while others limit the number of classes taken. Two to three classes per week are recommended. Schools often charge a monthly fee, ranging from $50 or more. Some schools charge a flat fee for training from beginner to expert. Many schools require students to regularly participate in competitions, and fees for these may begin at $25. Students are required to purchase uniforms and equipment as well. Uniforms may cost $100 or more, and protective equipment may cost roughly the same, depending on the practice. Prospective martial arts students should search for the style of martial arts that best meets their objectives. Students should attend classes at various schools (dojos), and should talk to students and teachers to find the right program. Finding a good instructor may be even more important than finding the right school. Students should search for instructors with such positive qualities as patience, knowledge, and strong communication skills. Prospective students should also search for schools with adequate facilities, including padded or sprung floors, full-length mirrors, and roomy practice spaces without obstructions.